B&S Micromaster displays both .00005" and 0.001 mm. The new, ergonomic design allows for easy one-handed operation (but this can be difficult if the hands are small). Brown & Sharpe Micro-Master digital micrometers conveniently measures beyond 1" (up to 1.2"). This basic model has just one button, so it's a cinch to use by anyone. It comes with or without SPC output. High-quality Swiss made with all the features that make Swiss micrometers famous. All feature a waterproof rating of IP54. In the table below, the Tesa number is used for international marketing, while the B&S model number is specifically assigned to the Brown & Sharpe branded version sold in the USA. There is no difference other than the slightly lower price of the B&S models. Check the current price and availability. Your Amazon order may qualify for FREE shipping. Discounts of 10% or more apply to some items. The models with "RS" appended, have RS232 output. (See page 227 for cables and other information regarding RS232 output.) Manufacturer's certification and instructions are included. They come with a 1-year warranty, so check to see if it applies before sending it anywhere. 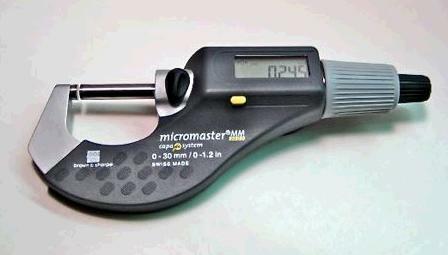 For more information on micrometer usage, repair, spare parts and calibration please check our index. Spare parts are often hard to come by and this should be kept in mind when buying these gages. The above items constitute advertisements on behalf of Amazon.com and are not to be construed as endorsements by Long Island Indicator Service. We strongly believe in buying quality tools and gages, and urge customers to check carefully before making a purchase. If the prices appear unusually low, we suggest proceeding with caution.